Today's So Shoe Me is the ESP Slides, $88, by and available at UNIF. Flashback to the 90s with these chunky holographic slides by UNIF. The substantial sole adds a retro clubkid shape without worrying about construction issues since these slip-on slides are brand new. The vintage text logo and rainbow upper adds another 90s edge and bright color to mix with your favorite summer pieces. These chunky cool slides will add tons of comfort and a rave ready edge to your festival style this summer, so go ahead and purchase a pair! Style these sandals with denim halter and cutoffs for the perfect coordinates this season. So Shoe Me a pair of platform sole slides with a 90s vibe that will give me the best of new and vintage style this season. 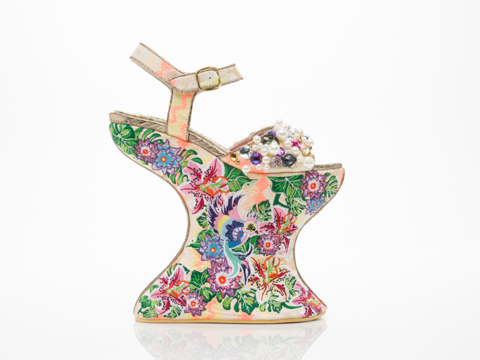 Today's So Shoe Me is the Bunny Hop Heels by Taylor Says, $169, available at Dolls Kill. Keep it cute in these bunny embellished heels complete with a carrot print sole! A sky high 6.5" heel and chunky platform add some signature height to these bunnyrific heels. The bunny embroidered face and ears add a super kawaii finish to these signature black t-strap pumps. A pom pom tail at the back is another sweet surprise that finishes off these signature shoes. Pair these bunny hop heels with a little black party dress and edgy accessories for the perfect sweet n' sultry night out look. So Shoe Me a pair of bunny haute heels that will add cuteness overload to my summer style. Today's So Shoe Me is the Atado Word Sandal, $170, by and available at Jeffrey Campbell. Add some positivity and a graphic punch to your summer style with these "Make Love. Not War." embossed sandals by Jeffrey Campbell. This club kid platform wedge is comfortable and cool and the stitched letter straps add an extra edge to the standout shoes. Make a statement from your sole with these conversation starting wedges that will add a black&white message to your summer style. Pair these platforms with a vintage rock leather vest and high waist cutoffs for the perfect fest look. So Shoe Me a pair of free love flatforms that will add a graphic statement to my summer style. Today's So Shoe Me is the Faux Leather Lace-Up Gladiator Sandals, $30, by and available at Forever 21 (Free Shipping until May 5th). Everyone needs a pair of lace-up sandals this summer and this affordable pair by Forever 21 is right on trend. If you're heading to fests, baseball games or the beach you want a pair of sandals that looks great but you won't cry over if they get ruined, so these Forever 21 sandals are the perfect mix of affordability and style. The lace-up front, saw tooth sole and luxe vegan leather construction make these the perfect everyday shoe that can be paired with casual cutoffs or chic summer print. Pair these summer ready sandals with some distressed white denim and an embroidered halter for a casual weekend look. So Shoe Me a pair of lace up vegan leather sandals that will add an on trend detail to my everyday summer style.